Unfortunately, there are only two such members from Carlton Ware, as all other moulds were destroyed some years ago. This one is the large Toucan Banjo Player (2) in a distinctive colourway. He is wearing a blue jacket with black lapels, red trousers and a red bowtie. The banjo is black. 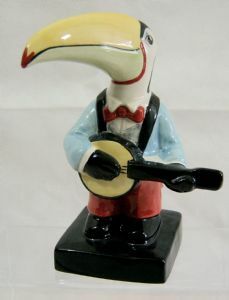 The lower part of his beak is a pale blue. These Band Members are exclusive to Artware Collectables.